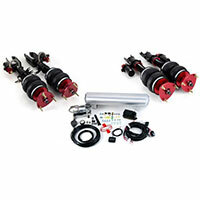 High end air suspension products from Air Lift Performance, Intermotiv, Firestone, Driverite and more. Air Suspension There is 1 product. The bigger the tank, the more air you have to play with. Just remember that a larger tank will also take longer to fill, so you'll need a compressor that can cope. Modern air suspension systems work using nylon air line with push fit connectors. The majority of threads used in these systems are NPT (National Pipe Taper) threads, though some use BSP (British Standard Pipe) threads. Air Springs (A.K.A. Air Bags) come in all shapes and sizes, and throughout the years we've seen them all. 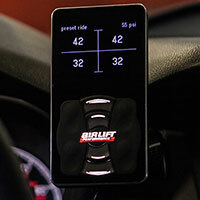 We supply parts from all of the top manufacturers such as Air Lift, Goodyear, Firestone and Dunlop to name a few. If you don't see the right bags listed please feel free to ask. 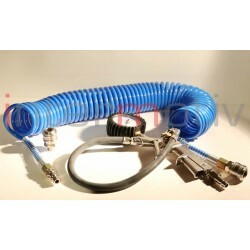 Tyre inflation kit with gauge and quick couplings for use with air tanks.